Mildred M. Cummings, 93, of Oran passed away on Saturday, September 1, 2018 at Allen Memorial Hospital in Waterloo. Visitation will be on Thursday, September 6, 2018 from 4:00 pm to 7:00 pm at the Geilenfeld Funeral Home in Oelwein and one hour before services on Friday. Services will be on Friday, September 7, 2018 at 11:00 am at the Geilenfeld Funeral Home with burial in Floral Hills Cemetery. 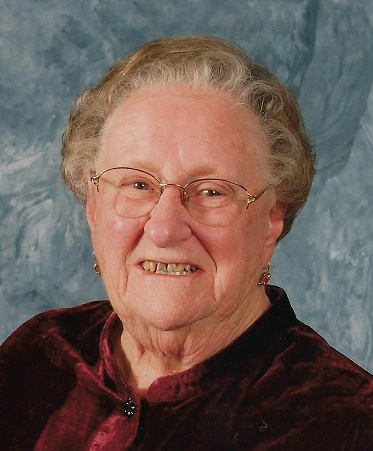 Mildred was born on July 21, 1925 in Oelwein, the daughter of Vernon and Minnie (Warnke) Gilson. She grew up in the Oelwein area, graduating from Oelwein High School in 1943. She was united in marriage to Clarence Cummings on June 4, 1946 at the Little Brown Church in Nashua. Mildred was a cook for the Wapsi Valley School system for over twenty years. She was a member of the Oran Methodist Church and Winnebago Busy Bee Club. In her spare time she enjoyed camping, sewing, reading, crafts and her family. She enjoyed life and will be dearly missed. Mildred is survived by her children, Vicki Rohrick of Oelwein, Steve Cummings of Oran, Connie (Dennis) Karsten of Waseca, Minnesota and Audrey Turitto of Hager City, Wisconsin; six grandchildren, Renae, Brian, Heidi, Brett, Zach, Amber and Celena; 15 great grandchildren: Jessinda, Sophia, Ayden, Landen, April (Dylan), Kodi, Paul “PJ”, Katie, Eva, Mason, Joseph, Braiden, Cody (Ashlea), Cameron and Conner; a sister-in-law, Audrey Gilson of Oelwein. She was preceded in death by her husband, Clarence; two brothers, Clarence and Virgil Gilson, a sister-in-law, Hilda Gilson, great-grandson Christopher and her parents. ????? ?And do not you think him a very handsome gentleman, ma'am?”?????????????????????????????????????????????? ?But how will you look?”?????? ?Can you come to-morrow?”Had he ever showed any signs of having taken opium?”The note was undated, and without either signature or address.Then after a short silence he continued:I dislike it very much,” he replied; but it must be done.”Did your wife hear all this?”I confess that I still share my uncle’s perplexity.”???????????? Very sorry to hear of Mildred’s passing. She was always so kind. Please accept my condolences. so sorry to hear about Millies passing.Her family are in my thoughts and prayer. Sincere condolences. Our prayers are with you. So sorry for your loss. Mildred will sure be missed. So many good memories.